Southfield-based Lawrence Technological University today announced the beginning of research and development on an autonomous campus taxi, following donations from several corporate partners. Hyundai MOBIS, the Korean automaker’s parts and service division, donated $15,000 for the purchase of a Polaris GEM e2 two-seat electric vehicle for the project. Dataspeed Inc., a Rochester Hills-based engineering firm specializing in mobile robotics and autonomous vehicle technology converted the vehicle into an autonomous drive-by-wire system. Ann Arbor high-tech firm Soar Technology Inc. also provided a laser-based radar unit to help the vehicle find its way, while Realtime Technologies Inc., a simulation technology firm, provided a cash donation. Hyundai MOBIS turned over the vehicle’s keys to LTU Provost Maria Vaz and C.J. Chung, professor of computer science, during a campus ceremony last week. LTU computer science students have already won an international award with the vehicle, following development of software that allows the car to operate autonomously. The group took first place in the new Spec 2 division of the Intelligent Ground Vehicle Competition, held in June at Oakland University. The competition required self-driving vehicles to demonstrate various functions, including following, lane change, traffic sign detection, obstacle avoidance, and left turns. 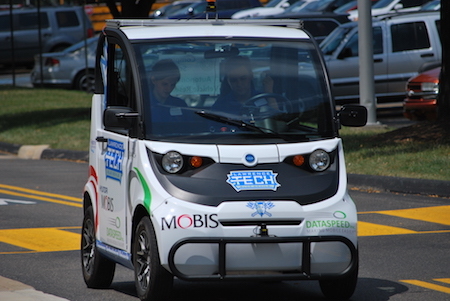 After winning the competition, LTU team members began reprogramming the vehicle to serve as an autonomous taxi on campus. It’s been renamed ACT, an acronym for Autonomous Campus Transport/Taxi. The university of planning to introduce level three autonomy, allowing both hands and eyes to be off the road, by Aug. 2018. LTU is a private university founded in 1932 that offers more than 100 programs through the doctorate level in its Colleges of Architecture and Design, Arts and Sciences, Engineering, and Management.